It is often difficult for conductors of major orchestras to find time for opera. For a few, like Franz Welser-Möst, the music director of the Cleveland Orchestra and the general music director of the Vienna Staatsoper, opera can constitute one side of a dual career. James Levine tried for something similar at the Boston Symphony and the Metropolitan Opera and might have succeeded had not health problems intervened. For others, the time and energy involved in leading a new production — which is what most conductors will be interested in — dictate that appearances in the opera house will be rare. Even so opera-oriented a maestro as Riccardo Muti now limits his opera engagements to an annual production for the Rome Opera and whatever he schedules with his orchestra, the Chicago Symphony. Until this month, Alan Gilbert had steered clear of opera houses since taking over the music directorship of the New York Philharmonic in 2009, although his opera credits before then included a brief stint as music director of the Santa Fe Opera and musical leadership of the Met’s production of John Adams’s “Doctor Atomic.” Mr. Gilbert’s semi-staged versions of Ligeti’s “Grand Macabre” and Janacek’s “Cunning Little Vixen” are considered high points of his Philharmonic tenure to date. From left, Michael Weinius, Emma Vetter and Anton Eriksson star in Wagner’s “Lohengrin” at the Royal Opera in Stockholm. Credit Alexander Kenney Kungliga Operan Now Mr. Gilbert leads a new production of Wagner’s “Lohengrin” at the Royal Opera here — a coup for its artistic director, the mezzo soprano Birgitta Svendén. Mr. Gilbert is no stranger to Stockholm due to his association with the Royal Stockholm Philharmonic, of which he is now conductor laureate. During the run of “Lohengrin,” he even managed to sandwich in a couple performances of Mahler’s Sixth Symphony. His “Lohengrin” proved well worth the trip to Stockholm. His treatment of the Prelude, with its ethereal, shimmering strings, captures the music’s dreaminess yet has a rhythmic vitality that forecasts the robust, surely paced, drama-oriented performance that followed. The orchestra plays beautifully for him, but equally fine is his work with the chorus, which sings with tonal richness yet, as guided by Mr. Gilbert, shades the music expressively. Happily, the Royal Opera supplied Mr. Gilbert with a strong, well balanced cast. 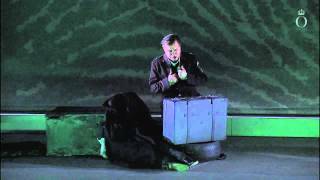 Michael Weinius sings the title role with a good, clear tenor and invests the knight’s narrations with exemplary diction and arresting use of head voice. Emma Vetter’s resonant soprano serves handsomely in the music of Elsa, the maiden in distress. Sometimes her singing is a little sedate, but she does well when standing up to her nemesis, the sorceress Ortrud, in their Act 2 confrontation and registers Elsa’s devastation at Lohengrin’s departure. Others have sung Ortrud more formidably, but the soprano Lena Nordin contributes an intelligent portrayal of the opera’s villain and is credible in Ortrud’s outburst “Entweihte Götter!” As Telramund, the husband she dupes, Johan Edholm sings with a muscular baritone, and Matthew Best’s orotund bass and authoritative bearing make for an excellent King Henry. I was less impressed with the production by Stephen Langridge (son of the late tenor Philip), which has a surfeit of ideas, many of which are confusing, especially in Act 1. Each of the characters has a doppelgänger, either in the form of a dummy or of a child wearing a full head-mask. When Telramund proffers his account of the disappearance of Elsa’s young brother Gottfried, doppelgängers of the siblings are seen rather redundantly walking together, like Hansel and Gretel. And after Lohengrin defeats Telramund in single combat — thereby vindicating Elsa of the charge of murdering Gottfried — soldiers attack Telramund’s doppelgänger-dummy with their fists in action that contradicts the ecstatic tone of the music, which proclaims Lohengrin’s triumph, not Telramund’s loss. One could indeed question the whole concept of single combat, with its faith in divinely determined outcome, and that’s just what Mr. Langridge does. Before the two fight — not with swords but in a game of Russian roulette — several large dice are brought on stage, as if it’s all just a crap shoot. Whatever point Mr. Langridge was trying to make, those dice look plain silly. And Lohengrin apparently prevails in the confrontation simply by training the gun on Telramund when he has possession of it. Fortunately, the action is more streamlined after Act 1, but one can question the desirability of having Elsa’s bed suspended above the stage, with her often in it, for much of the opera, even if it is arguably justified, both by the dream she narrates of the knight in shining armor who will save her and by a bed’s presence in the bridal chamber she briefly shares with Lohengrin. Conor Murphy’s décor, dominated by a scrim and backdrop depicting gigantic fingerprints, has some interesting details, including the concentric, rounded rectangles that frame the action of Act 2. The simple bridal chamber, equipped with television and sliding glass doors, returns in its entirety for Elsa’s entrance in the final scene. Mr. Murphy’s costumes, which find the men of the chorus in battle fatigues, are resolutely of the present but also a source of confusion when Elsa and Ortrud look almost identical in long, gray coats at the end. But this is Mr. Gilbert’s show and makes one eager for his next appearance in an opera house. The ROYAL SWEDISH OPERA and its artistic director Birgitta Svenden scored a coup in April when Alan Gilbert presided over six performances of a new Lohengrin. Until then Gilbert had not conducted opera since taking over as music director of the New York Philharmonic in 2009, apart from well-received semi-staged versions with the orchestra of Le Grand Macabre and The Cunning Lade Vixen. Though Gilbert is no stranger to Stockholm, due to his long association with the Royal Stockholm Philharmonic, this was his Royal Swedish Opera debut and his first time conducting this masterpiece of German Romantic opera. The Prelude captured the dreaminess yet invested the music with a rhythmic vitality that presaged a robust, surely-paced, drama-oriented performance of the opera as a whole. He shrouded the dark exchanges between Ortrud and Telramund in Act 2 with an air of mystery and let the Act 3 Prelude emerge as exciting but not vulgar. Especially impressive was the close of Act 2. The orchestra played beautifully for him, and equally fine was the eloquent, shapely singing he drew from the chorus. On April 9, Michael Weinius sang the title role with a good, clear tenor and invested the knight’s narrations with exemplary diction and arresting use of head voice Emma Vetter’s resonant soprano served handsomely in Elsa’s music; sometimes her singing was a little sedate, but she had some strong moments too. Lena Nordin was not a notably formidable Ortrud, but her portrayal of the sorceress was intelligent and included a credible `Entweihte Goner! ‘ . Johan Edholm sang Telramund with an effective, muscular baritone, and Matthew Best’s orotund bass and authoritative bearing made for an excellent King Henry. Stephen Langridge’s production had a surfeit of ideas, some of which were confusing. At the start of Act 1, for instance, soldiers dressed in battle fatigues guarded a group of prisoners —who? And why? Each of the principals had a doppelganger, either in the form of a dummy or of a child with head mask. After Lohengrin defeated Telramund in single combat, soldiers mercilessly pummelled Telramund’s doppelganger-dummy, thereby contradicting the ecstatic music proclaiming Lohengrin’s triumph. Lohengrin and Telramund duelled by playing Russian roulette, which Lohengrin won by simply. training the gun on Telramund when he had possession—hardly good sportsmanship. Fortunately, the action was more streamlined after Act 1, but was it really helpful to have Elsa’s bed suspended above the stage for much of the opera? Conor Murphy’s decor, dominated by a scrim and backdrop depicting gigantic fingerprints, has some interesting details, including concentric, rounded rectangles that frame the action of Act 2. The bridal chamber, equipped with television and sliding glass doors, returns in its entirety for Elsa’s entrance in the final scene. Murphy’s costumes are resolutely of the present but present a source of confusion when Elsa and Ortrud look almost identical in long, grey coats at the end. But this is Gilbert’s show and makes one eager for his next appearance in an opera house.